22 December 2014 – The National Treasury Management Agency (NTMA) announces the cancellation of €500 million of the Irish Floating Rate Treasury Bond due to mature on 18 June 2038. The bonds, which were issued in connection with the Irish Bank Resolution Corporation Act 2013, were purchased today from the Central Bank of Ireland. Following the cancellation the total nominal outstanding for this bond will decline to €1.5 billion. As we know the €25 billion of the FRNs were taken on by the Central Bank as part of the restructuring of the Promissory Notes. The FRNs have maturities ranging from 2038 to 2053 and the interest coupons on the notes are at fixed margins ranging from 250 to 268 basis points the 6-month Euribor rate. The Central Bank also received €3.5 billion of the 5.4 per cent 2025 rate government bond as part of the transaction undertaken to make the 2012 cash payment on the Promissory Notes. As long as the Central Bank holds the FRNs and bonds the net interest cost to the overall government sector is the ECB’s main refinancing rate (currently 0.05 per cent). The NTMA pays out the interest but as it is paid to the Central Bank it is not a loss to the State. In fact most of the interest would likely be recycled back the Exchequer as part of the Central Bank surplus (though the Bank does have some building works ongoing). The Bank intends to sell the combined portfolio of the FRNs and the fixed rate bond as soon as possible, provided conditions of financial stability permit. As a minimum, the Bank will sell securities in accordance with the following schedule: to end 2014 (€0.5 billion), 2015-2018 (€0.5 billion per annum), 2019-2023 (€1 billion per annum), and 2024 on (€2 billion per annum until all bonds are sold). As part of this strategy, the Bank sold €350 million of its holdings of the Government 2025 Fixed Rate Bond in 2013. So now we know that the Central Bank has sold (at least) €850 million from the combined portfolio. This is ahead of the schedule which indicated that €500 million of sales would be made by the end of 2014. If we assume that the actual price paid by the NTMA for the €500 million of FRNs doesn’t matter much (like the interest any surplus would remain in the wider government system) then it would appear that this transaction has some interest benefits, even if that is only moving from a variable to fixed rate on €500 million of debt. The transaction reduced the gross general government debt (Maastricht criteria) by €500 million though net debt is little changed (depending on the amount of cash used to buy the €500 million FRN that was cancelled). As a result of the €850 million of sales there is now additional interest being paid to someone than if the original €500 million schedule was adhered to. Although money is fungible we could assume it to be either the holders of the 2025 bond who bought from the Central Bank in 2013 or those who took the 2030 bond from the recent NTMA issue. It doesn’t really matter. We know that interest that would have been paid to the Central Bank if it has held on to the bonds is now being paid to someone else. So the question is why were an extra €350 million of the bonds sold ahead of the schedule set out in spring 2013? And will these accelerated sales continue? Sec. 135. Extension of look-thru treatment of payments between related controlled foreign corporations under foreign personal holding company rules. (a) IN GENERAL.—Subparagraph (C) of section 954(c)(6) is amended by striking ‘‘January 1, 2014’’ and inserting ‘‘January 1, 2015’’. (b) EFFECTIVE DATE.—The amendment made by this section shall apply to taxable years of foreign corporations beginning after December 31, 2013, and to taxable years of United States shareholders with or within which such taxable years of foreign corporations end. Nice and simple. The expiry date of S.954(c)(6) is extended to tax years including 01/01/15 or alternatively the provision applies to all tax years that end before 31/12/15. The “look-through” rule applies for another year. The “look-through” rule was introduced in 2006 and gave legislative effect to many of the effects the resulted from the “check-the-box” administrative provision introduced by the IRS in 1998. The “look-through” was introduced for two years and has now been extended four times. Apple avoided U.S. taxation for the entire $44 billion through a combination of regulatory and statutory tax loopholes known as the check-the-box and look-through rules. Using the “look-though” rule Apple was able to defer the payment of $12.5 billion of US corporate income tax in 2011 and 2012. With “check the box” and the “look-through” rule Apple is able to treat its Irish-incorporated subsidiaries such as ASI and AOE as disregarded entities for US tax purposes. This means that the royalty and dividend transfers between these companies are not seen for US tax purposes and therefore the anti-deferral provisions of Subpart F for such passive income flows are not triggered. Instead the IRS looks through these companies and sees Apple received active income from distributors, wholesalers, retailers and ultimately customers on its global sales. All the intra-company passive income transfers are ignored and the US tax code has a general deferral principle for the US corporate income tax due on non-US active income. Apple gets the US to look through the company’s royalty and dividend transfers which would generally trigger a US corporate income tax payment. Of course, tax systems around the world see these royalty and dividend payments and the amount of profit remaining in their jurisdictions is relatively small. Under the current system this is correct as distributing, wholesaling and retailing are not very profitable activities. The issue is that the royalties that have to be paid to the US to sell Apple’s US-designed products are not triggering a tax payment in the US. The Tax Increase Prevention Act of 2014 was passed 76-24 by the US Senate. And yes, the senior member from Michigan did vote “yea”. We don’t have to be entirely sceptical of this move to allow Apple, and other companies, to reduce their tax payments. It could be that the one-year extension (and the previous three extensions were for two years) is to allow the removal of the “look-through” rule from the US tax code to be formally negotiated and organised in 2015. That is one possibility. It could be that the provision will be extended again for tax years ending in 2016 and further. And we could even see the “look through” rule become a permanent feature of the US tax code. Either way it won’t be an issue for Carl Levin who has retired. These are the important changes; not changes of Irish law introduced for PR effect. The prices of petrol and diesel are falling rapidly. For petrol prices below €1.30/litre are now commonplace with prices as low as €1.239 now seemingly available. The Strategic Stockholding Levy is used to finance the National Oil Reserves Agency and I assume the Better Energy Levy is used to fund activities undertaken by the Sustainable Energy Authority of Ireland. The above per unit taxes come to 61.37c per litre. VAT at 23 per cent is applied on these to bring the subtotal to 75.49c. This is the lower-bound price that applies before the cost of the product itself is factored in. Subtracting 75.49c from the pump price of 123.9c leaves 48.41c. This is the VAT-inclusive price of the fuel excluding the per-unit duties. The VAT component is 9.05c giving a pre-tax price of 39.36c. It is probably also worth noting that regulations under the Biofuel Obligation Scheme require road transport fuel suppliers to use a minimum of 6 per cent biofuel in their overall fuel mix. This is estimated to add around 0.8c to the cost of a litre of petrol. Although not significant, the carbon tax (€45.90 per 1000L of petrol) is not recalculated to reflect the amount of biofuel in the mix (on which the carbon tax should not be payable). Absent this obligation it is likely that the pre-tax price of petrol in the above calculation would be around 38.5 cent/litre. It would be impossible to adhere to the minimum schedule and keep a straight face when claiming that selling more would threaten “financial stability”. Selling even a bit more than the minimum puts the ball back in the court of those who are anti-printing – it is up to them to call out the ICB on selling far less than they could. ICB can say they sold more than the minimum. Selling to the NTMA avoids having to report that they were sold to investors and there was demand for much, much more (eg see recent Irish sov sales). Irish consumption of oil products fell 31% between 2005 and 2013. Yet our GDP is nearly back at its previous peak. So there is a welcome decoupling here of oil use from economic growth. Traffic on the M50 is returning to peak levels. New car sales up 30% last year. Major public transport projects have been cancelled and replaced with projects to increase capacity and demand for commuter car travel. Petrol consumption has fallen dramatically but diesel use is growing and there may be health consequences – particularly for people inhaling diesel particulate pollution in urban areas. I think that tax avoidance and the rollout of unlimited debt are two key pillars of the current economic system. And the fact that the BoE, the Fed and the ECB keep failing to model inflation correctly seems to be linked. What kind of car do Google and Apple use to funnel profits through Ireland? The preferential treatment of Diesel fuel seems to be an example of over-ambitious attempts to use the tax system to correct for externalities. The French, who invested heavily in new Diesel automotive technology, are now going to ban these cars from the big cities because of their contribution to summer urban smog. A special purpose vehicle, I guess. Thanks for that. Great post. The price of petrol is something I’ve been wondering about. I had heard some government department spokeman say it was in the order of 60 something cents. Now I realise he/she wasn’t including VAT on the product or VAT on the tax. Isn’t this a good oppurtunity for government to take road tax off the car and put in on fuel. Give us more of a pay as one goes model? FYI Reuters comprehensive report on possibility of QE. As Ernie has pithily expressed it, there are all sorts of problems with our so-called growth in GDP. Your claim of ‘decoupling’ may not be credible. Similarly with the ‘health consequences’ claim. The copious income and direct taxes paid by the private sector workers in Apple and Google plus thousands of other businesses of all sizes pay your wages bad pension. Our generosity allows you to continue teaching your flat earth theories to undergraduates. Your concern about diesel emissions as the back-marker Irish switch to diesel has no basis. 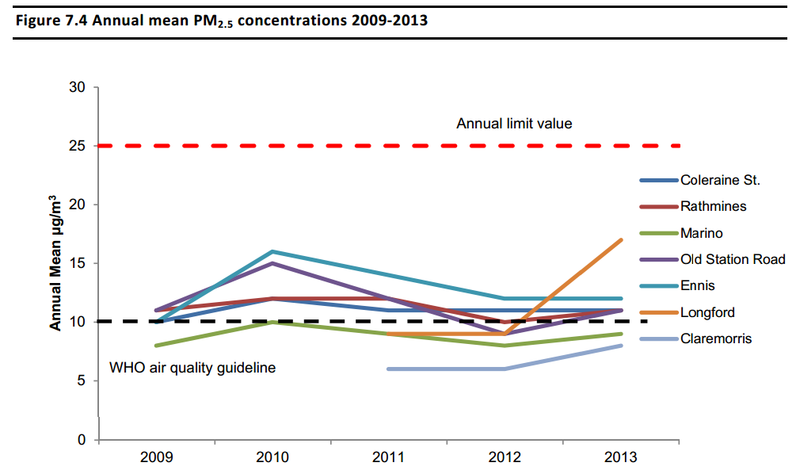 The PM10 problem was addressed years ago in the EU by a Directive requiring compliance with an escalating series of exhaust emission standards (EU2, EU3, EU4, EU5 and shortly EU6) which bring PM10 and NOx emissions to extremely low levels. I was involved in the development of emission abatement equipment for commercial vehicle diesels a decade ago (EU4) in DE, NL and UK and I can assure you things have moved on. When is the last time you saw a contemporary diesel belch black smoke as the juvenile driver used full power to overtake something? The decline in oil consumption will be dominated by reduced domestic heating expenditure in rural (off gas grid) areas for obvious reasons. Transport requirements are a much smaller use of oil products than heating buildings which is ~50% of all Irish consumption. I understand your trade is economics. I don’t understand why you consider GDP as a credible metric for Irish economic activity given all that is known about the national ‘business model’. You imply that there are “projects to increase capacity and demand for commuter car travel”. I think that is misrepresenting the recent actions of the Strategic Roads Authority which is an agency that has generally performed strongly for Ireland. I do agree that public transport is very poor in the state and particularly in the capital although I believe that the heavy rail underground projects for Dublin are over-the-top ‘old school’ responses to requirements for public transport provision that light surface rail can do more cost-effectively. I also pay taxes (income and direct). By your logic, I pay my own salary. Assuming 100% of your salary is paid by the State, you do not make a net contribution to the state. It is merely an internal transfer. All your tax payment does is reduce the soaking that a private sector worker has to take. Hsving paid you, the private sector worker is entitled to ask what value she receives. With great respect, according to an objective viewpoint public sector employees such as you don’t actually ‘pay your taxes’; the Irish wealth-generating sector pays the entire gross earnings of such public sector staff from their public sector employments, taxes included. 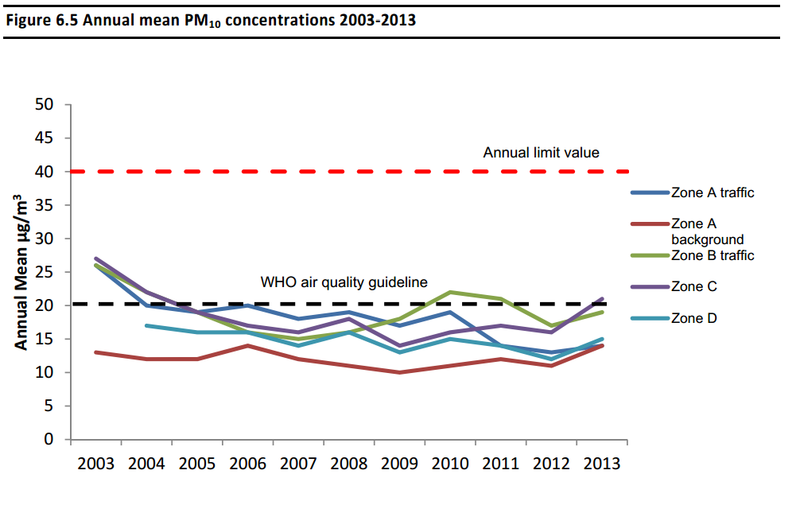 The EU exhaust emission standards are welcome and have surely led to improved air quality since the 90s but the more recent trend is not so great. You are right that GDP is not a great metric of economic activity. It lacks any reference to the quality of growth or to growth fuelled by borrowing. I think that zoning car-dependent housing estates outside Dublin and then building motorways to connect them to the capital is fairly characterised as planning to increase car commuting capacity and demand. light surface rail is fine where it can be grade separated. In fact, with respect, neither view is correct. This voice from the past – again topical – may help clarify matters. The issue is, as CJ points out, the capacity of the economy to provide the goods and services which we as a collectivity view as necessary. Therein lies the rub not the nature of Ernie’s pay or the tax he pays where he has to be put, in personal terms, on exactly the same footing as any other taxpayer. Indeed, the permanent wail is that in defence of “frontline services”, notably in health and education. The dispute is about how these can be paid for with a large proportion of the electorate apparently convinced that it is not their taxes that need do so. Hello Ossian. I didn’t realise you were both technically-literate and an elected representative. Please dont be offended by my accusing you of being an economist! Those trends are indeed worrying especially the across-the-board uptick in emissions in 2013 which applied in wealthy South Dublin villages as much as in impoverished market towns. One would have to know more about the monitoring protocol – how much of this stuff was transport emissions v. domestic heating exhausts; diurnal variation; effect of local climate/rainfall etc in order to understand what if anything this data implies. My point about GDP was that it is now so distorted by tax shifting multinationals that it is thoroughly debased as a metric of economic activity undertaken by people in Ireland. By how much is the private sector generously subsidised by government ? And what sort of value generated is sustainable ? How do you measure anything economically these days anyway ? The BoE seem to be struggling with it. A lot less than 100%. I think I’ve got my names muddled apologies to Tull and Ernie. For clarity I am not insinuating that the value of the contributions of either gentleman or indeed anyone employed in the public sector is lesser than that of people such as myself who work in the private sector. Nor am I suggesting that some citizen workers are more special than others. DOCM has made my point more clearly thanks. Your assumption that I am a liability to the state assumes that I do no work. That is false. My work is my “contribution to the state.” What’s yours? Ask yourself this: what kind of revenue generating capacity would the Irish private sector have without educators? Or Guards? Or a health system? If you go back to say 1690 where the state had pulled back from ensuring basic security you’ll find that the cost to the private sector was murderous. Successful wealth generation requires a lot of state input. I am not at all an economist but there is a strange tension between politics and economics as both fields seek to place values on the intangible. Politicians state their values and then reach out to economics to justify them. Economists state they have no preconceived values but fortuitously discover that the results of their assumptions and calculations accord with their political views. The lead agency for Irish air pollution monitoring is the EPA. I don’t know how accurate their data is. The latest European Environment Agency’s report on air pollution was published recently and estimates that Ireland had about 1,200 premature deaths last year due to air pollutants. A big question is the proportional origins of these pollutants. The distortional effect of MNC activity is often darkly referred to but has anybody tried to estimate what that is and how it happens? GDP exceeds GNP in Ireland because the revenues of foreign owned firms are discounted from GNP. However the net revenues and activities of foreign owned firms are taxable in Ireland as any domestic company. Tax take from MNCs has been estimated at €5 billion/year by the Revenue Commissioners. I don’t know if anyone is suggesting that a locally owned sector with similar value-add would pay more in taxes. I should add that Apple’s scheme of avoidance in particular was unbelievable and far outside the pale. I don’t if their revenues affected Irish GDP numbers as everything seemed to be booked offshore to both Ireland and the US. I don’t dispute that Gardai, nurses and doctors capital stock ( both tangible and intangible). I am not sure if the contribution of social science lecturers is positive. I am not assuming that you do not work. I am merely speculating that the work you do has no benefit. Two well-informed individuals on MNC tax strategies involving Ireland post here regularly, one is the author of the current thread and the other is Michael Hennigan. There are lots of controversies to choose from in this domain as you know and we need not dig into them now. Suffice it to say that from the perspective of many Irish indigenous firms the dominance of the MNC sector has a crowding-out effect which makes growth difficult for very many reasons. Basing a large slice of the economy on selling high margin professional services in accounting, tax and legals to the 600 odd US MNC’s stationed here might raise questions about sustainability in the minds of some folk. That’s just an expression of your own philistinism, Gradgrind. “I am not sure if the contribution of social science lecturers is positive. How much value have bankers destroyed over the last 20 years Tull, just roughly will do. What would Daniel Loeb have written to the stars of the Dublin Chamber of Commerce of the tiger years ?